York & District TUC will be commemorating Workers’ Memorial Day this year, by holding a service of remembrance on 29th of April at All Saints Church, Pavement (just off Parliament Street), commencing at 6pm. 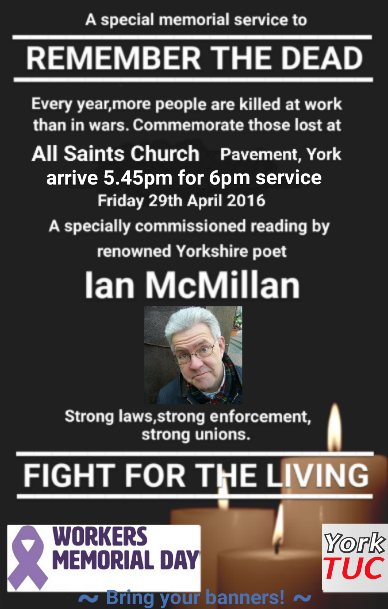 There will be a couple of speakers, a specially commissioned poem for the occasion by renowned Yorkshire poet Ian Macmillan (who will be reciting his work), hymns and choral music, as well as a collection at the end for victims of mesothelioma. We very much hope you can make it along to join us in remembering those who have lost their lives in the workplace. If anyone needs help in terms of finding the venue, do feel free to contact us, and also feel free to forward this to anyone you think would be interested in attending.